In what ways may I place and pay for an order? What if I purchase a product and it is not what I expected or wanted? There are several ways to order with or without a credit card. Currently we receive orders in the following ways: Credit cards, Checks, PayPal, Google Checkout, Telephone, Fax and Mail orders. On ALL of the above methods of ordering you should add your products to the shopping cart in the usual way. When you get ready to place your order you will be given the above options (CC, Mail, Telephone, Fax and PayPal) for ordering. When you select any of the above methods, the shopping cart will lead you through with directions and forms (which you can display and print out) and will guide you, step by step, for the order method you have selected. Ordering online is secure. We are PCI compliant. This means that we adhere to the most rigorous online security standards to keep your information safe. 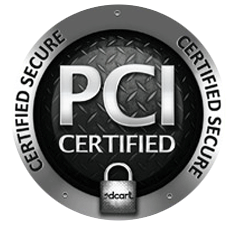 Our shopping cart is hosted by 3dcart which is a PCI Compliant Certified Secure Hosting Provider. During the checkout process any information sent to our shopping cart is encrypted, making it impossible to intercept or steal. You can order with confidence as we protect all sensitive payment and contact information as it moves from you the customer to our checkout server. All of our products are manufactured to the highest standard and quality. However if you should purchase a product that does not meet your expectations, you may return an item for refund or replacement within 10 days if the product is found to be defective. Software is returnable for replacement only! NO refunds are given on Software. Shipping charges are non-refundable. All returns must be accompanied by the original invoice. When you return an item, please indicate the reason for the return. If an item is returned for other than defective product reasons, a 15% fee will be accessed to cover Credit Card sale and refund charges. Your satisfaction is our primary desire. Returns should be mailed to: Ministry Helps, 746 Vern Cora Road, Laurens, SC 29360. Ministry Helps is a ministry devoted to the distribution of Godly materials to the body of Christ. An emphasis is placed on tried and proven writings from well established authors. Many of these works are produced by those who have already gone on to be with the Lord, yet their ministry endures. Ministry Helps has a number of sites to serve our customers: www.ministryhelps.com | www.bibleandbookstore.com | www.titheandofferingscriptures.com | www.dakebible.com | www.ewbullingerbooks.com | www.ewkenyonbooks.com and www.larkinbooks.com. Ministry Helps is located at: 746 Vern Cora Road, Laurens, SC 29360. At Ministry Helps we recognize your right to privacy and are committed to protecting your privacy. We use the information that we collect on our site to provide you with a superior shopping experience. When you order, we will ask for information that will ensure that your order is processed in an accurate, secure, and timely manner. Information we ask for includes your name, e-mail address, contact phone number, mailing and billing address, and credit card number and expiration date. In fulfilling your order, we only share your personal information with outside parties to the extent necessary to fulfill your order. We will use your email to send you e-mail confirmation of your order as well as any shipping updates. The first email you receive will serve as receipt of your order. The information included in this email consists of sales price, order number, and shipping information. You will receive a second email when your order ships. We protect your account information against unauthorized access or release. We do not give, sell, rent, or loan any identifiable personal information to third parties.